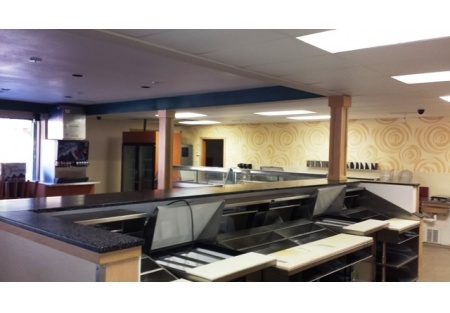 Sandwich shop restaurant space for lease with all the fixtures and equipment in place to open a shop today! Sierra Foothills...above the fog and below any significant snow. You might get a little snow per year, but it usually melts that day. Located on I-80 busy Freeway exit to catch travelers and locals....with potential to reach up to 70K per day traffic. This highly visible retail center was built in 1991. New Lease available for Quality restaurant build out Fully furnished. Approx. 2,000 sqf At $1.50 sqf +/- depending on agreed upon terms. Former Togo's sandwich store. Can include use of equipment and furnishings. Includes large walk-in cooler and freezer, two ADA compliant restrooms. Lots of equipment, Tables and Chairs ect....Available immediately. No identifiers remain. Make a proposal....would work for many concepts...currently no hood system, but one could be added! Landlord willing to finance some Ti's to change concept or modify Ti's.